DIY: I've finally tried the Oatmeal Cleanser! | Memorable Days : Beauty Blog - Korean Beauty, European, American Product Reviews. 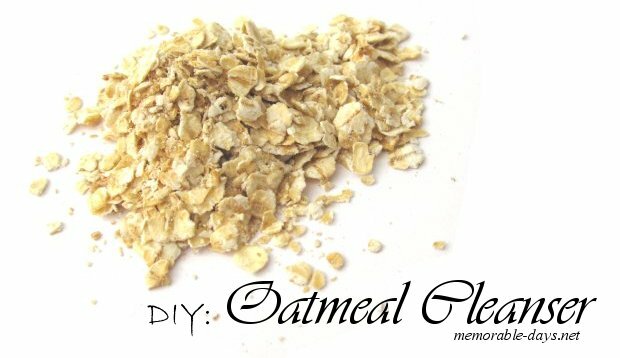 DIY: I've finally tried the Oatmeal Cleanser! After I had seen the video from Bubzbeauty where she explained how to use Oatmeal as a cleanser, I directly wanted to try it out... however, I just didn't have the time to do it. Lots of Bloggers have tried it already and they all wrote a good review about it. It definitely attracted me to try it out myself because I'm still searching for a moisturizing cleanser which doesn't leave a tight feeling on my face. I recently had the time to try it and I have to say ..... well, just continue with reading ;). Is oatmeal really good for my skin? Yes it is! Oats removes the surface dirt and impurities, it gently exfoliates, it hydrates and soften the skin. It's a soothing and gentle cleanser and is perfect for people with dry skin and even for people with sensitive skin! 1. Put two tablespoons of oatmeal on your hand. 2. Together with the oatmeal, clench your fist together and put it under lukewarm water. Leave some gaps so the water can reach the oatmeal. 3. + 4. When you squeeze the oatmeal together you will get some milky liquid, you can put it in the bowl and apply it on your face. Oatmeal smells so good lol! If you want more milky liquid you can add more water to the oatmeal. Apply the oatmeal on your face and it should look like the picture on the left. The oatmeal will exfoliate your skin and removes your impurities and dirt on the face. Oh deze kende ik niet! oe, dat klinkt erg nice! :D Waar kan je eigenlijk goedkoop oatmeal kopen? nice! i like that is is simple and affordable. This cleanse really is good. I tried it a long time ago and it left my skin really soft and glowing. nice!!! like lotion i use has oatmeal in it. oatmeal is soo yummy though with milk i have it many mornings, not sure ifim willing to sacrifice food heehee :D its best when you find a more natural solution to health problems, thanks for sharing!! i've heard so many things about this, i should really give it a go! time to buy some oatmeal! Bijna bij elke supermarkt.... Ah kan je ook halen xD havermout is niet zo duur. Gaat meestal in grote pakken, dnk zelfs wel dat je het thuis hebt :p? hmm, volgens mij wel ja :'d. Niemand eet het op omdat het zo droog is XD.